January has been a month of repairs. The first thing I accomplished was replacing the lining of my husband’s wool coat. This coat was a hand-me-down from our neighbor. 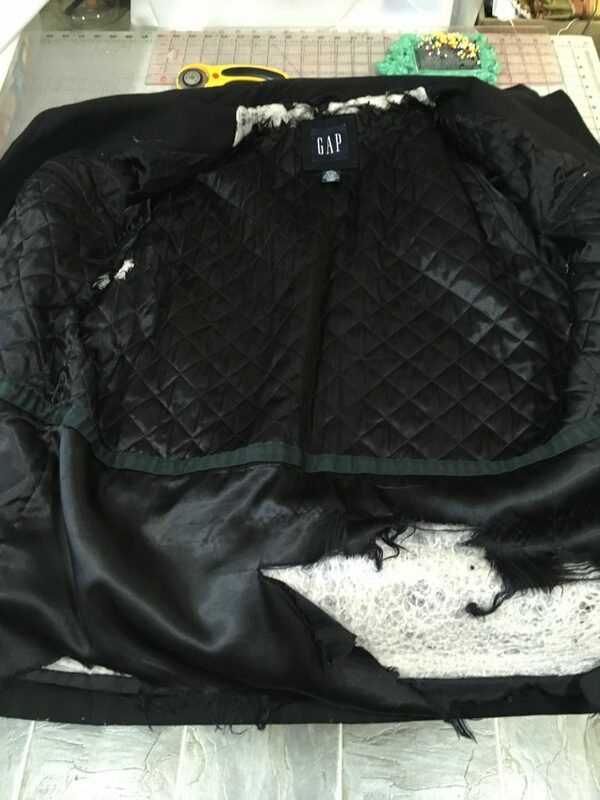 The lining was in need of repair, but my motto is if it’s not showing to the public, there’s no need to repair. When the first shreds of fabric started to hang below the hem, I simply cut them off. 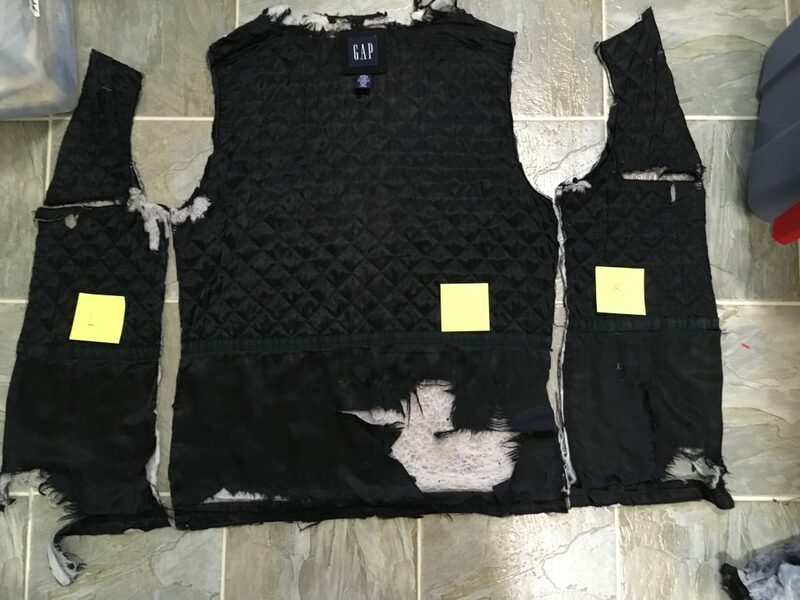 But eventually the lining needed to be replaced. The steps are straightforward. 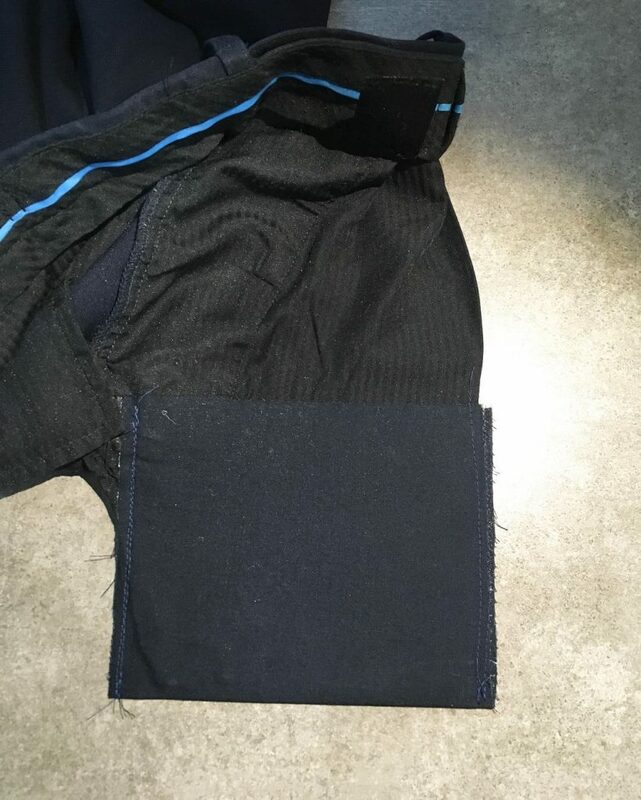 Remove the lining using a razor or seam ripper and separate all the pieces. I did not bother to separate the lower and upper lining. 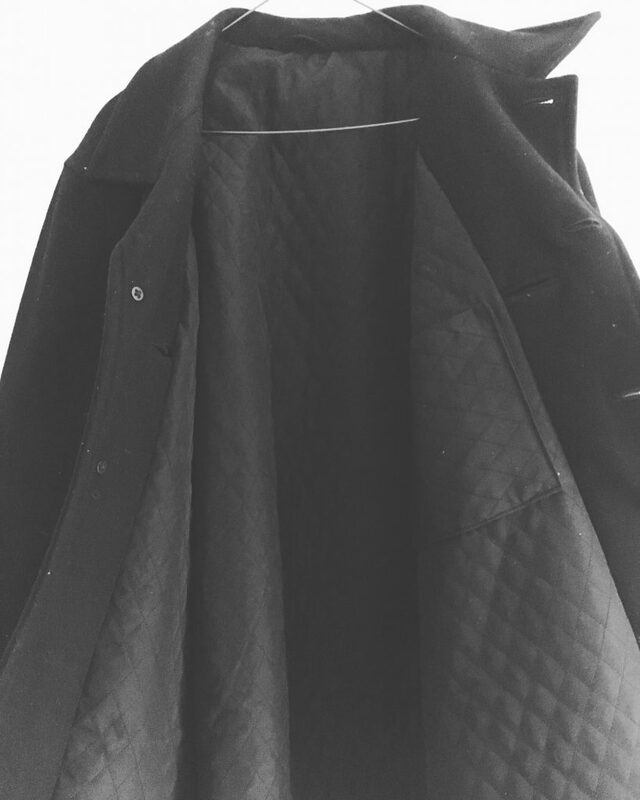 Instead, I chose to use a quilted fabric for the entire lining. Typically, the sleeves are made of regular lining fabric but I also used the quilted fabric, which I found at Fabric.com. I saved the pieces and used them as pattern pieces. As you can see many of my pieces were shredded. 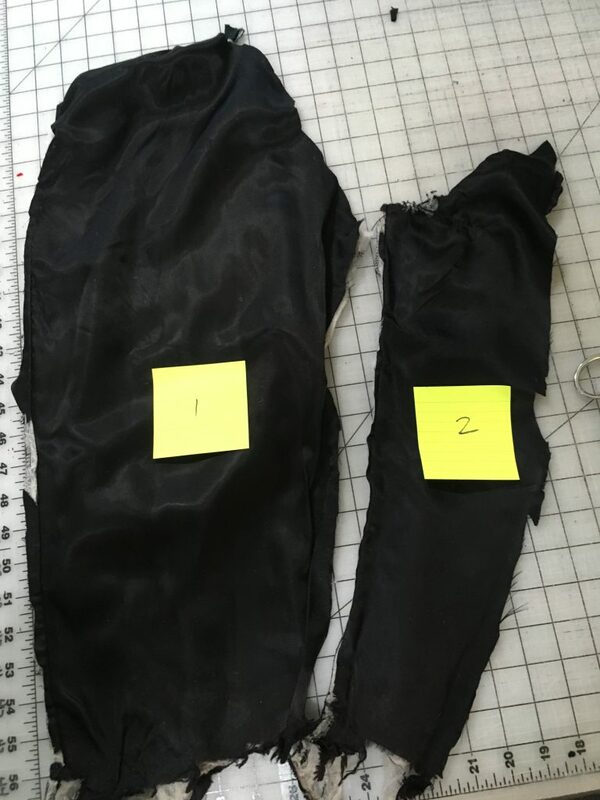 Some of the pieces I cut apart, so they did not have a seam allowance. I added one back in when I cut the new pieces. A lining doesn’t have to be perfect, just functional. So if my new pieces didn’t fit together perfectly, I added a gather or pleat or cut it down during the process. There were two inside welt pockets which would have taken a long time to duplicate since they were half on the wool and half on the lining. My husband likes to use the inside pocket but he agreed a simple patch pocket would work just as well. In the end, I was pleased with the result. On the jeans front, I made repairs for a client and for my husband. The first photo shoes an example of a common repair. 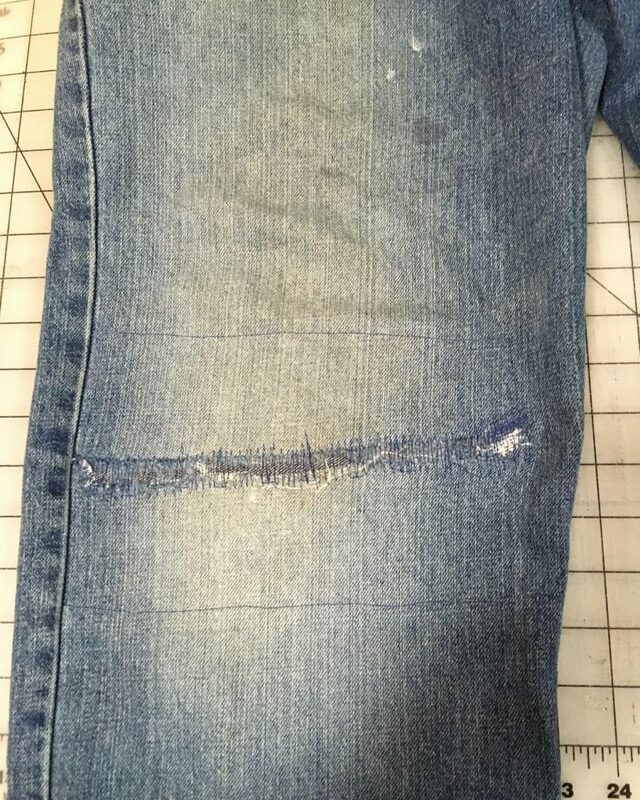 If there is a hole or tear near a stress point, I take some scrap denim and apply Heat n Bond lite to the side that faces outward. I fuse that to the inside of the jeans. You could stop there if you don’t sew. For more durability because iron-on patches eventually peel at the edges, I use the mending stitch on my Janome. If you don’t have a specific mending stitch, you can simply stitch back and forth in two directions over the hole/tear. 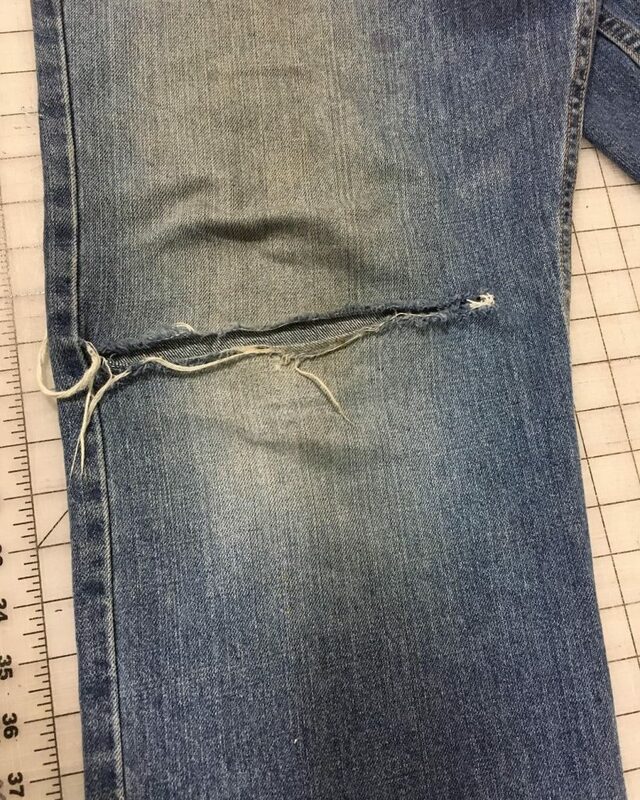 Another repair I often make is to patch the knee tears in jeans. These can pose a sewing challenge depending on your machine. For me, I don’t have a sleeve arm, so I have to manipulate the fabric so that I am not stitching through any other layers. I start by making an iron on patch. 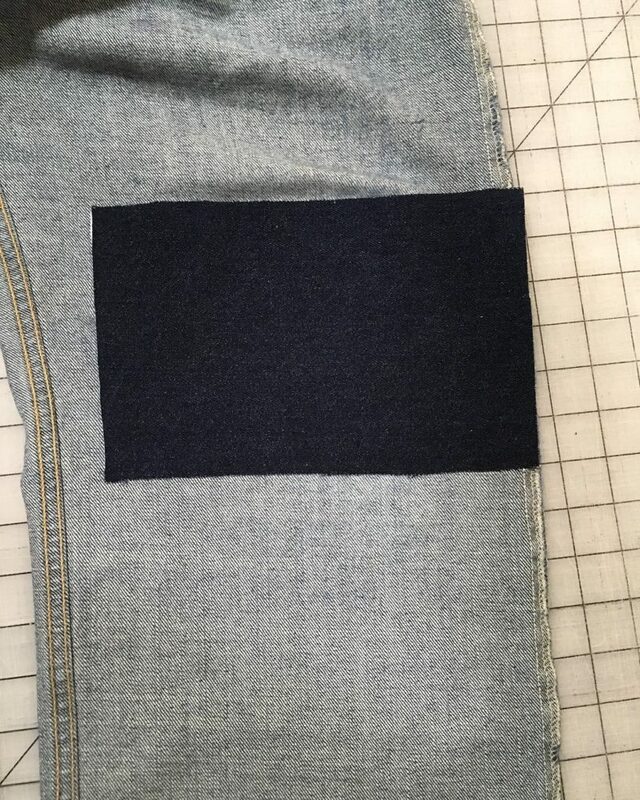 A apply Heat n Bond Lite to a denim scrap and fuse it to the inside of the jeans. My patch on the inside. The lighter side of the patch faces out to more closely match the denim. I stitched around the perimeter of the patch and then used the mending stitch along the tear. I did not do as extensive of stitching as I did above because it was harder for me to reach the knee (without removing side seams). 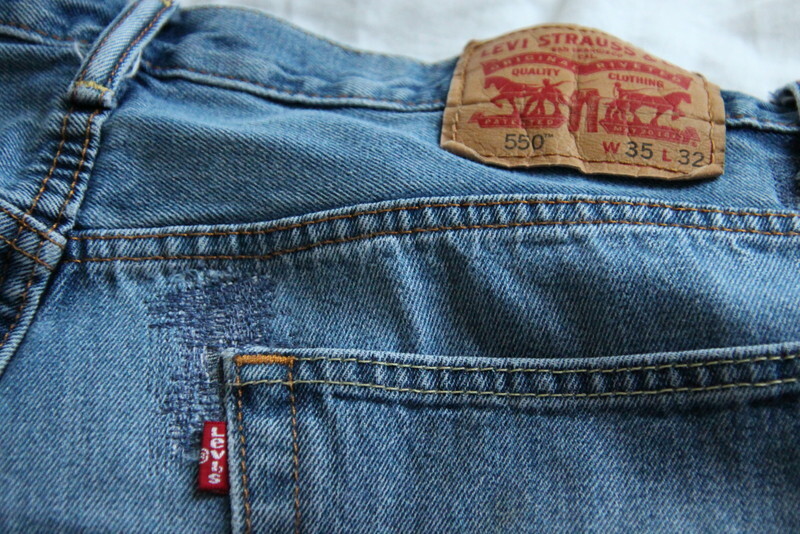 These aren’t necessarily pretty fixes, but these become my husband’s work-around-the-house-and-yard jeans so they get the job done. My final repair is another one that I have to do frequently for my husband. He often has holes in his pants pockets. Sometimes I fold and stitch along the bottom of the pockets but the fabric isn’t usually strong enough to sustain the pocket for long. He worries that he might lose his keys. So I used a piece of cotton about 6″ x 11″ and applied Heat and Bond Lite to it. I then folded it in half and sandwiched the pocket in between. I applied my iron to fuse my new pocket to the outside of the old pocket. I also stitched along the sides to add additional reinforcement. I also replaced a zipper on my son’s burgundy jeans, but didn’t take a photo!